There are plenty of grooming tips for eyebrows that are too thick or too thin, but what can you do with wiry eyebrows that won’t lie flat? Have no fear – your eyebrow hairs aren’t that different from other hairs on your body, and there are conditioning and styling products that can tame even the most unruly brows. Many people with wiry eyebrow hair also have thin or patchy eyebrows, so plucking isn’t always the best solution. You can carefully trim longer hairs with eyebrow scissors, especially hairs that extend far above your desired brow line. Before cutting, use an eyebrow brush to carefully comb brows into their natural shape. Cut carefully to avoid over-trimming. Eyebrow gel is designed to hold eyebrow hairs in place, like hairspray for the brows. Many gels are sold in tubes and applied with a round brush, like mascara. You apply gel as the final step in your eyebrow grooming process, after shaping and penciling. Gels are either clear or tinted to match the brows. Tinted gels offer the added bonus of covering gray or providing color fill for thin or patchy brows. If you don’t have gel, take a tip from beauty expert Michelle Phan who recommends spraying a little hairspray on your finger then smoothing it over an unruly brow. Lip gloss and petroleum jelly are also acceptable substitutes for eyebrow gel. Mix eye shadow with petroleum jelly for a homemade version of tinted gel. If you don’t like petroleum-based beauty products, aloe vera gel is a natural alternative. If you want to control wiry eyebrow hair and also want fuller-looking brows, eyebrow mascara could be the answer. Just like mascara for the eyes, many eyebrow mascara products contain fibers that plump up the look of your brows while holding the eyebrows in shape. Older women and women who are growing out over-plucked brows often find they have more wiry eyebrows than before. 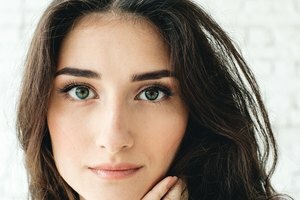 One DIY solution is applying hair conditioner to the brows, but this is not recommended by skin care specialists due to the proximity to the eyes and the delicate nature of the eyebrows. If you really want to try a conditioner, look for serums with natural ingredients. Some people use tea tree oil to condition brows, though it's also thought to make brows thicker – an undesirable side effect if you already have thick, wiry eyebrows. 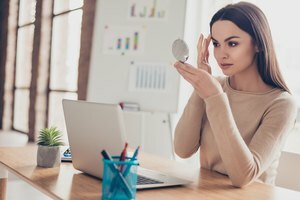 Eyebrow stylists have access to a wide range of styling products for all kinds of eyebrows, so before you try to fix your wiry brows on your own, consider getting professional help. If you suspect that your eyebrow issues are caused by a medical problem, the best place to start is with a dermatologist. Catie Watson is a freelance writer with a lifelong love of fashion and interior design. She has a degree in English, attended the Art Institute of San Francisco and spent several years working as a theatrical costumer. She writes for HERLIFE Magazine and a variety of websites and print publications.